Juno had already gotten plenty of buzz by the time I saw it in Dec. but I still enjoyed it from burger-phone start to track-star finish. Ellen Page does such a remarkable job as a smart-alecky-but-vulnerable pregnant teen and Michael Cera is downright adorable in his geeky awkwardness. It's a quirky, family tale with some real zingers a la Napoleon Dynamite and Little Miss Sunshine. For shiz. And it's pretty incredible that first-time screenwriter Diablo Cody was a former stripper and plucked from obscurity from her blog. (See, blogs can be handy dandy tools for writers.) Fans can download a scene from the screenplay in the side box alongside this NYT article, "Off the Stripper Poles and into the Movies." How's that for a Hollywood ending? 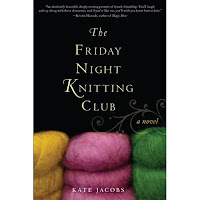 My friend Kate Jacobs passed through Decatur on her book tour for her super successful debut novel, The Friday Night Knitting Club." We worked together at Redbook and were part of a tight-knit (ha!) group of friends who bonded over Tuesday night drinks. She was kind enough to give me a shout-out during her talk at the library where women knitted furiously and demanded to know how she writes two books a year. The answer? With noise-canceling earphones.